When I was in my early 20's, long before I even owned a professional camera, my family decided it was time to update our family photos. My husband (then new boyfriend) had a new camera with a tripod so we all donned our ultra cool matching white t-shirts and jeans, and headed to Shubie Park to take our pic. We achieved a half-decent shot of the whole family posed in rows sitting on a picnic table, and proudly hung it in the family living room. We also sent the photo to family all around the world. My dad's brother in Scotland saw the photo and his good-natured slapstick joke was "That sure is a nice looking baseball team!" OK...point taken! Maybe the white shirts and jeans weren't the best choice, they were the easy choice. In our defense that was a very popular look at the time. To learn from our mistakes, here are some tips on what to wear for your session, along with some examples of colour palettes. Start with selecting a colour palette that suits the theme of your photos. For outdoor fall photos earth tones are always a nice choice. For spring photos you may choose lighter pastel colours. For summer beach photos you may opt for neutrals with a pop of colour. Choose 1 or 2 accent colours and 1-2 neutral colours and stick within that palette. Think "coordinating" not "matching". 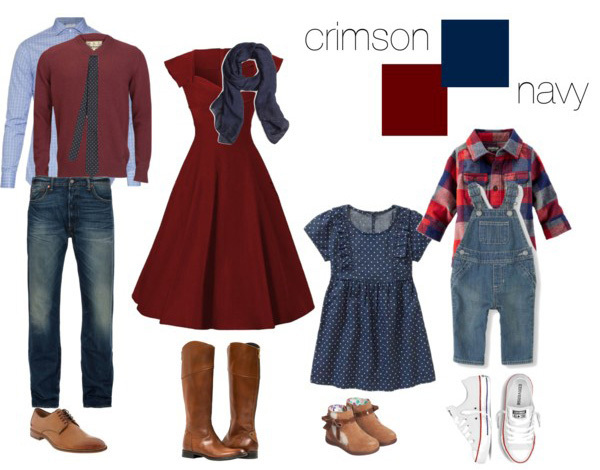 In other words, rather than having everyone wear the same thing, have each person wear clothing that falls within your chosen colour palette, but wear it in different ways (examples below). Pattern is your friend! Mixing several coordinating patterns can work well. 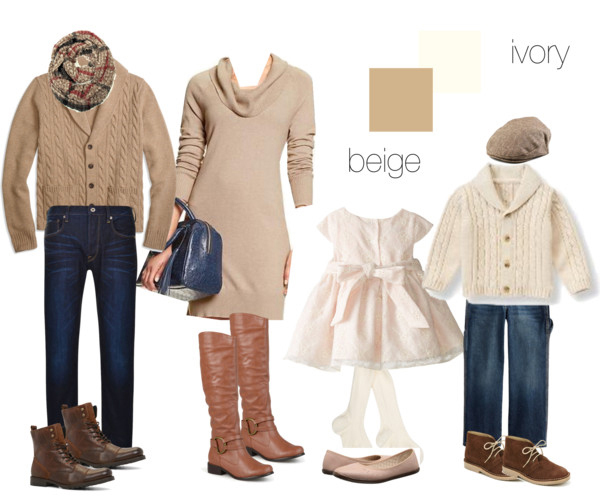 Maybe mom wears a muted floral scarf and baby wears a striped shirt under a sweater, both in the same colour tones. Avoid tiny stripes or checks, or clothes with very subtle tiny texture. These small patterns can sometimes cause "moiré" which occurs when fabric (or other objects) contain repetitive details (such as lines, dots, etc) that exceed the sensor resolution. As a result, the camera produces a strange-looking wavy pattern. It looks bad in photos and is hard to remove in post-processing. Don't forget accessories! Scarves, jewelry, hats and shoes are all ways to layer in pattern and colour for a richer look. At the end of the day, comfort is key! Looking put together doesn't mean you have to dress really formal (unless that is the look you are going for!) When natural looking, relaxed photos are the goal, being able to move around unrestricted is important. 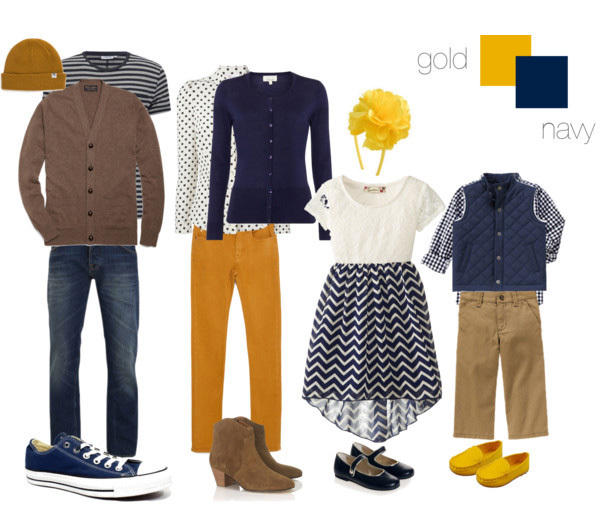 Below are some sample outfit ideas. I am always happy to assist with making clothing choices. Feel free to send me photos of the items you are considering if you would like a second opinion.